When steam railway enthusiast Tony Boreham retired from Garner’s Funeral Service in Kingston upon Thames recently, owner Howard Garner arranged a surprise for him. Tony spent a day with the staff at the Mid Hants Railway in Hampshire getting first-hand experience of what life was like working on a steam railway. 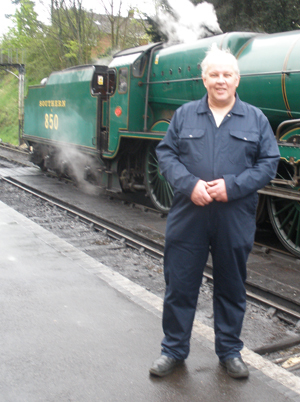 Tony, who had a thoroughly enjoyable time, is pictured standing in front of Locomotive number 850 "Lord Nelson" on The Mid Hants Railway. “I have always had an interest in steam railways and what Howard arranged for me in addition to the lovely retirement meal, was a complete and lovely surprise,” said Tony, who has worked at Garner’s since 2004. He was initially primarily a funeral arranger but was soon was doing bearing, conducting and removals as well – “as one does in a small family-owned and run firm”. Before joining Garner’s, Tony worked at Kingston Hospital in Surrey for a total of 41 years, 31 of which were in the operating theatre. He worked his way up to the position of principal operating department practitioner. Tony is currently in the process of moving to Devon and plans to spend his retirement doing up the house, gardening and having days out but he is also likely to be doing some casual work for local funeral directors. And what will he miss most about Garner’s? “Working in a small close knit family firm, Howard Garner’s support and encouragement, and serving the families who entrusted the funerals of their loved ones to us,” he said.